Anna Maria Island is the perfect place for a beach vacation with family, friends, or both. 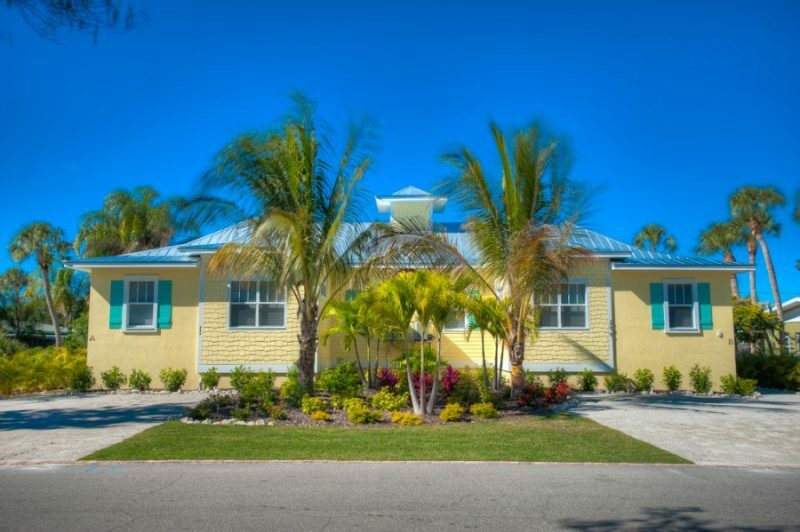 Our four-bedroom houses for rent on Anna Maria Island offer perfect hotel alternatives for multi-generational families, groups of friends, or couples with grandkids. 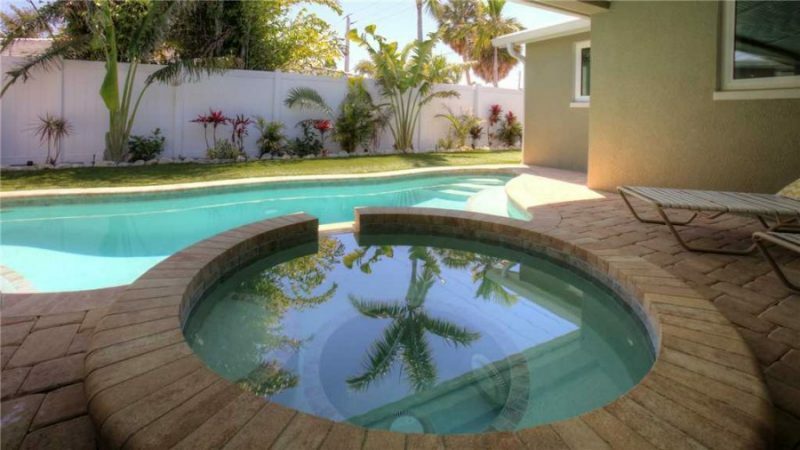 Here are a few rental properties to consider for your next Anna Maria Island vacation. Aqua Bay is unique because it has a pool and spa on one side of deck and the canal on the other. 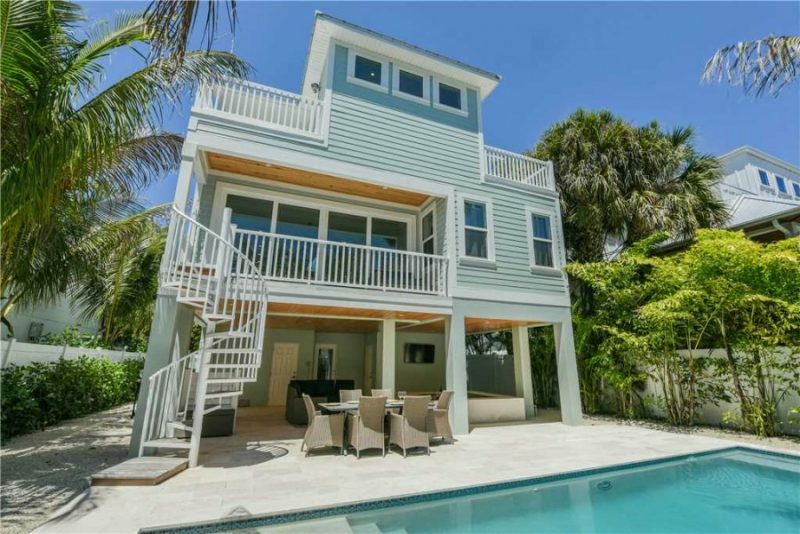 A five- to seven-minute walk to the beach, this beautiful Holmes Beach property sleeps eight people comfortably, and has a rooftop firepit overlooking the canal. 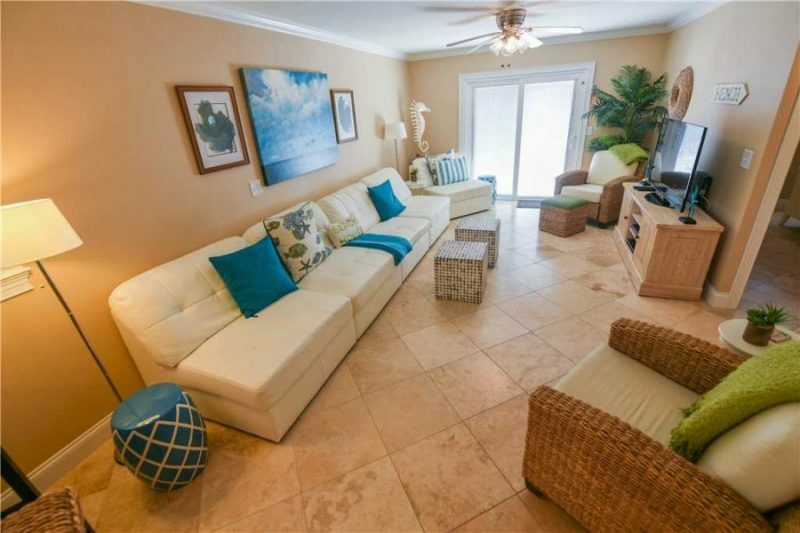 AMI Beach House is a sprawling four-bedroom bungalow with a spacious interior in Holmes Beach. It features a private, heated pool and covered spa for rainy days, as well as giant chess, a swing, a hammock, and a foot shower. It has a large living room for relaxing with family and friends, and is steps – about 30 seconds – to the beach. Pineapple Key is the perfect place to host a family with older kids. The property features two sets of bunks, a private heated pool, a covered living area, and plenty of entertainment: Wii, board games, and multiple TVs. Located in Holmes Beach, this home is located just two houses from a free trolley that offers quick access to the rest of the island. Avenue E features a large outdoor deck on the roof dotted with colored deck chairs. From here, you can see the beautiful waters of the Gulf of Mexico, whose beaches are a short, two-minute walk away. It has a small pool that sparkles in the sun surrounded plenty of colorful deck chairs, as well as a covered patio with comfortable furniture, a two-car garage, and an elevator. This bright, yellow four-bedroom is a great place for families who want to bring their pup along, as it is dog-friendly. It’s also perfect for young children, as it has a pool with a large shallow end – and submerged barstools for adults – and quick access to the beach. 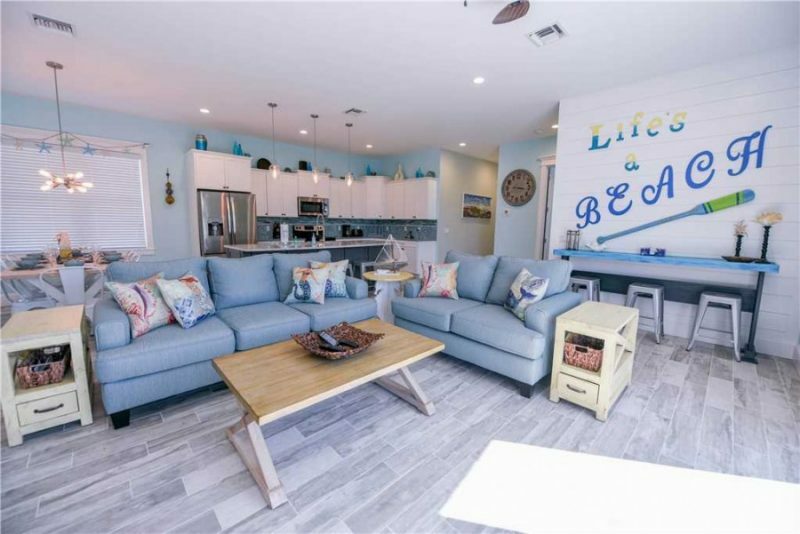 Our Seahorse Beach House is located at the south end of the island in Bradenton Beach, and is one of the best four-bedroom houses for rent on Anna Maria Island for people who like to shop and dine. The property is just around the corner from bustling Bridge Street, and is a 30-second walk to the warm waters of the Gulf of Mexico. 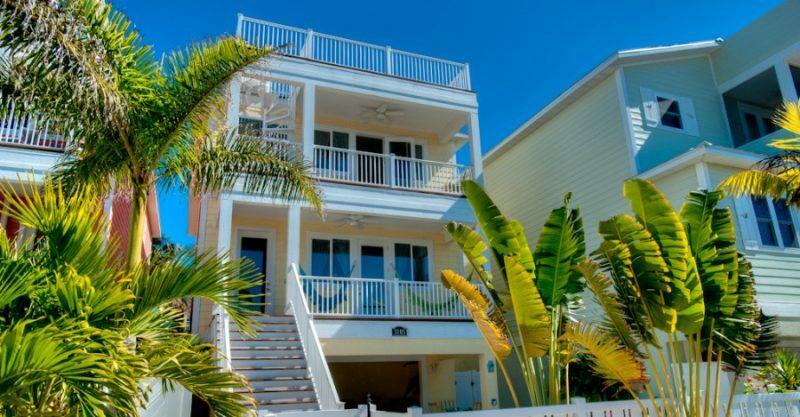 This brand-new Anna Maria rental is one-of-a-kind, featuring a number of decks overlooking the ocean. It’s right on the beach, with a large, resort-style saltwater pool in the backyard. It sleeps 10 people, thanks to a bedroom with two bunk beds – perfect for large families and groups. An elevator makes this property accessible. 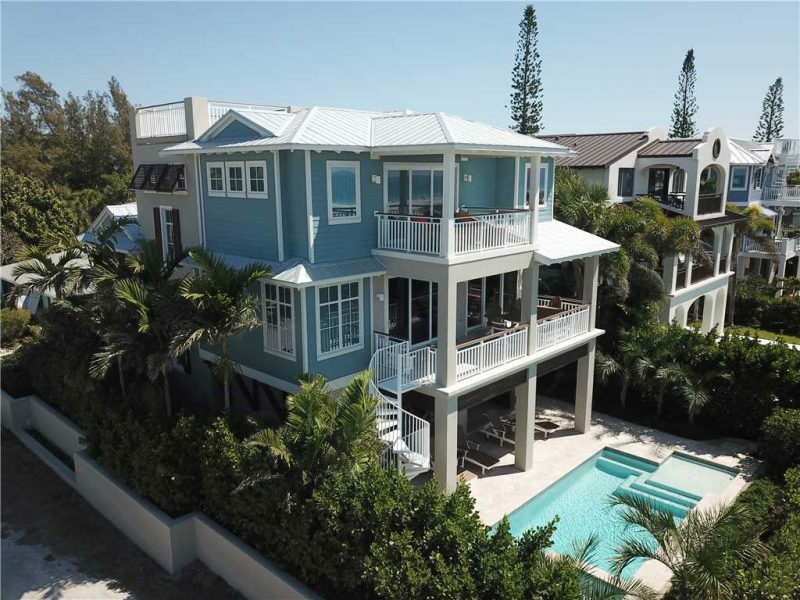 As the name suggests, this AMI rental offers spectacular views of the sun setting over the Gulf of Mexico. Watch it while soaking in the pool, on a lounge chair with a glass of wine, or through the large dining room windows. Located on the island’s quiet north end, this four-bedroom is chock-full of amenities and right on the sand. 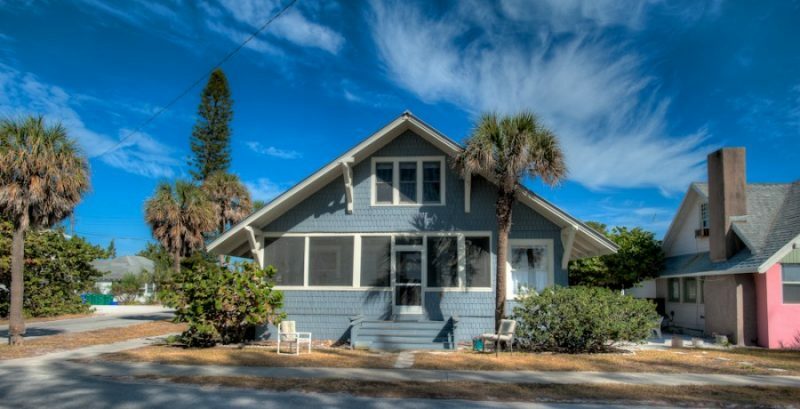 Also on the north end of the island is Sunchase Villa, a ground-level beach cottage that exudes Old Florida living. From the screened in front porch overlooking the Gulf of Mexico, to the wooden interior, to the cozy rooms, you’ll feel right at home in this luxury cabin. For those who want to spend their whole vacation on the beach, this vacation rental might be your best bet. Located just a few houses from the beach, Reef Romance offers quick, easy access to the beach on a quiet street. At the foot of the outdoor spiral staircase is a rectangular pool surrounded by tropical foliage and cushioned lounge chairs. 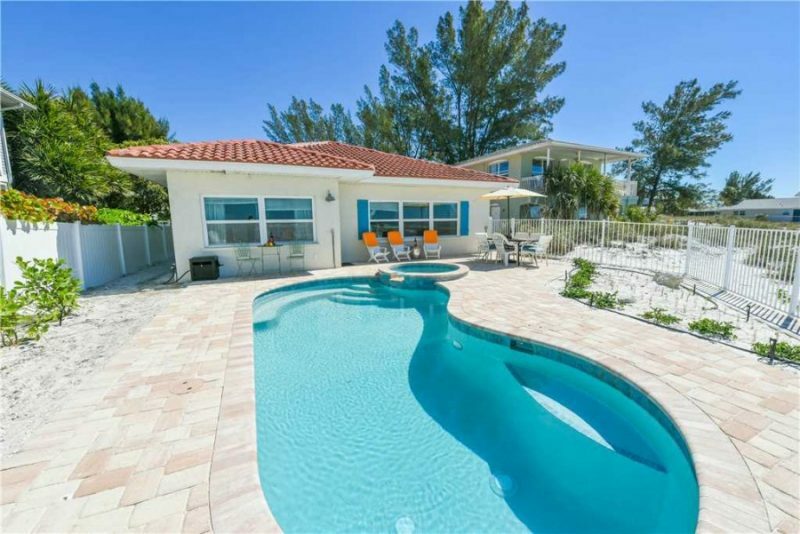 With so many incredible four-bedroom houses for rent on Anna Maria Island, you’ll have no trouble finding the perfect vacation rental for you and your family. Check out any one of these property listings on our website for more information or to check availability.